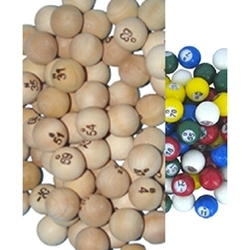 Bingo Supplies → Bingo Balls 7/8"
A full set of 7/8in sized bingo balls of various designs. Set of wooden bingo balls that measure 7/8 of an inch in diameter. The numbers are branded onto the ball. Set of multi-colored plastic bingo balls that measure 7/8 of an inch in diameter. The numbers are printed behind a clear window inset into the ball.